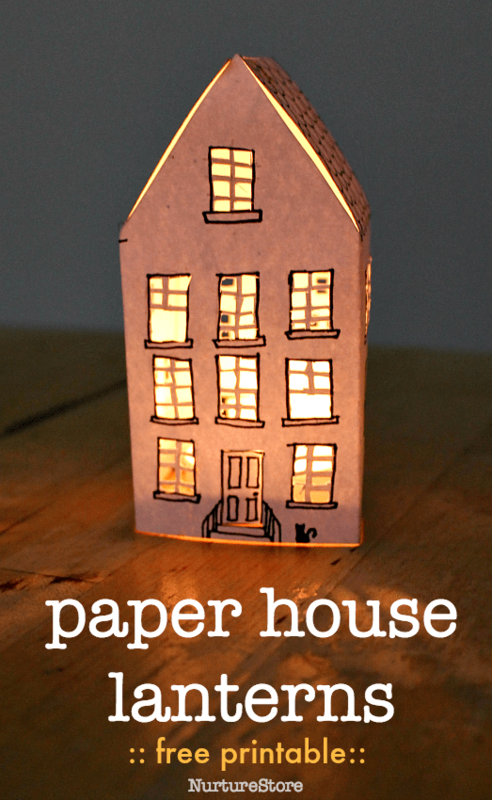 These easy paper house lanterns are so pretty and lead the way into exploring math and art, where you live, and architecture around the world. 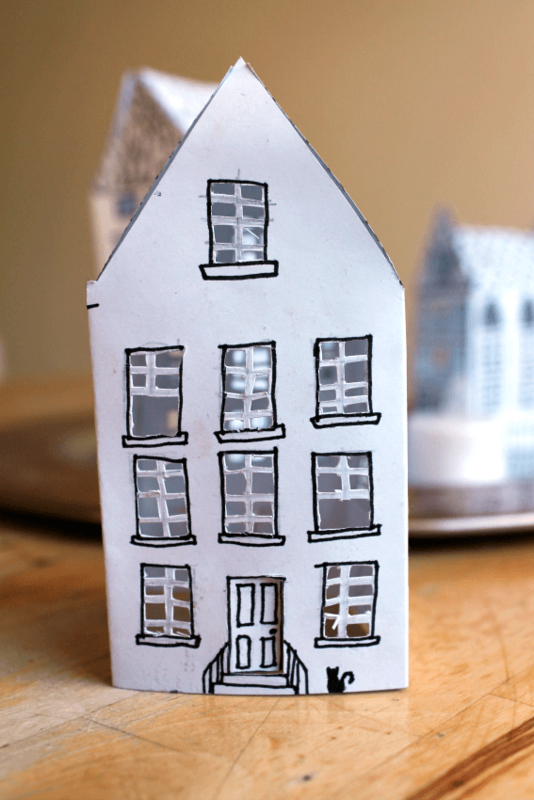 Download my free printable house template and customise to make your own gorgeous paper houses. 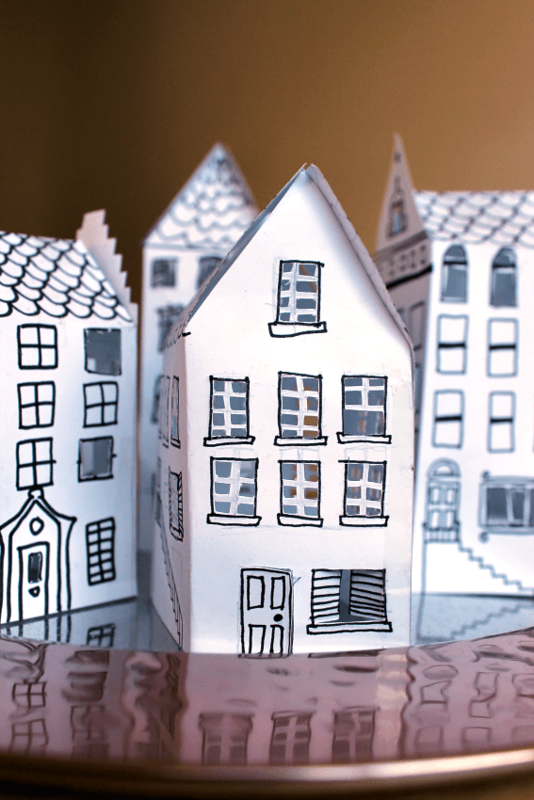 This paper house craft is so pretty. We made them at a crafternoon we hosted with friends. 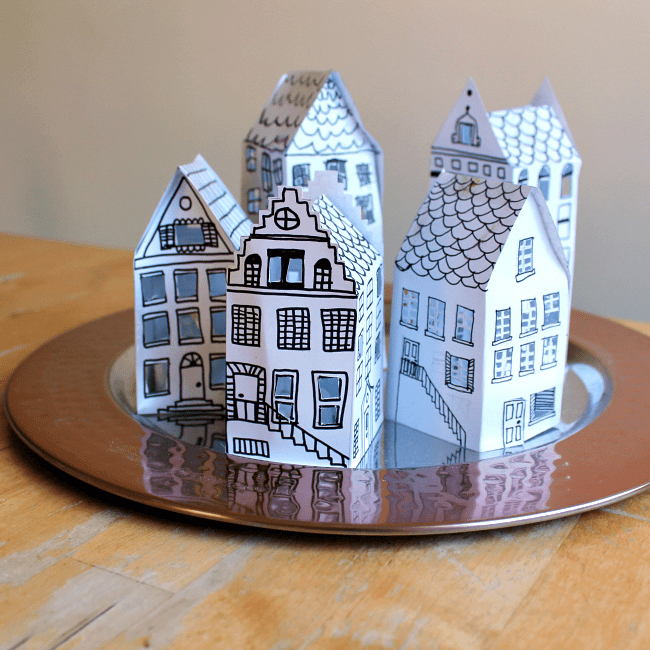 They’re great as a group art activity because everyone can make their own design and then you can gather them together to create a little town. They also work very well if you are doing a ‘where I live’ topic, or an ‘all about me’ theme as they lead into conversations about the kinds of houses everyone lives in and which types of building you can find around your town. You could use them as starting point to explore architecture and different styles of houses around the world. I also think they’d make a lovely paper house advent calendar. You could add some glitter paint to the roofs to make them look frosty, give each house door a number for your calendar, and instead of a candle, pop a chocolate or sweetie inside each house. 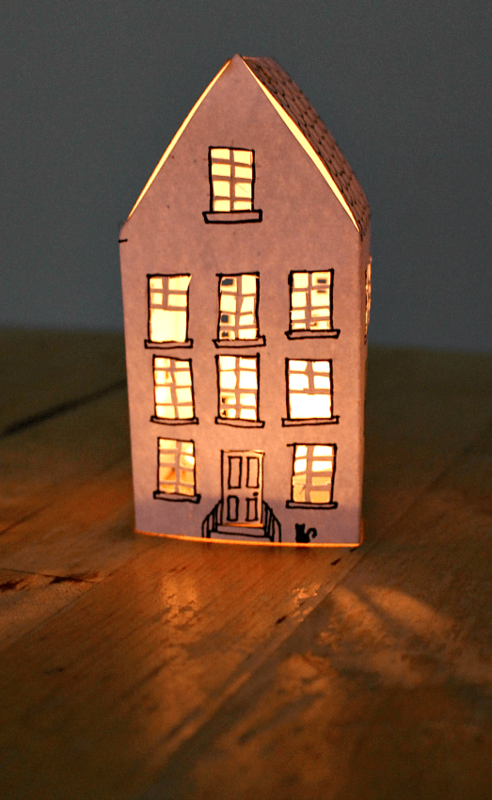 It’s very easy to make a paper house. You start with a basic outline, and then you can add as little or as much detail as you want to. You can get a free paper house template printable further down this page, which my daughter has made for you, but you might like design your own. It’s a great math meets art challenge. Think about what a house would look like if it was peeled open and laid down flat. How many sides does a house have? What basic shape is each side? How could you add a roof on top? Draw out your house sides on a piece of card or thick paper, using a ruler and pencil, or print off our free house template and use it as the basis of your own house. You’ll find a tall and a short house template on the printable, and you can vary the shape of the roof to customise your design. Then use marker pens to draw on the details of your house. 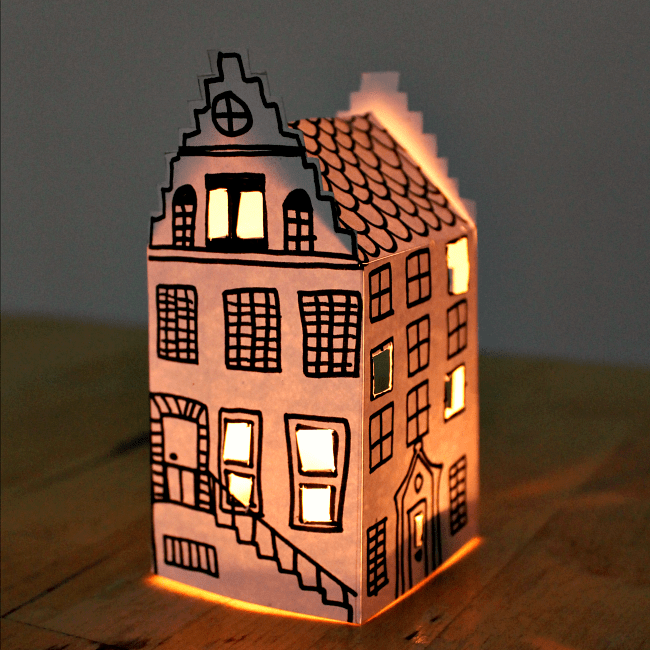 We were inspired by the tall thin houses that are typical in Amsterdam, but you can design your house any way you like. Perhaps draw a real house that you know, or one from your imagination. If you are going to use your house as a lantern, cut out some of the window panes so that the light from your candle can shine through. We used a craft knife for this. You don’t have to cut out every window pane – just a few will create a pretty effect once you switch your candle on. Some of our children took great care and enjoyed cutting out every tiny pane. It’s up to you! You might also like to cut open a door or shutters, so you can open and close them. Then cut out all around the outside of your house, and fold it (along the dotted lines on the printable) to give your house its 3D shape. Finally, use a strip of clear sticky tape to hold the two open edges of your house together. Use a second strip along the top of your roof to hold the two panels together. More beautiful art ideas for your children to try! 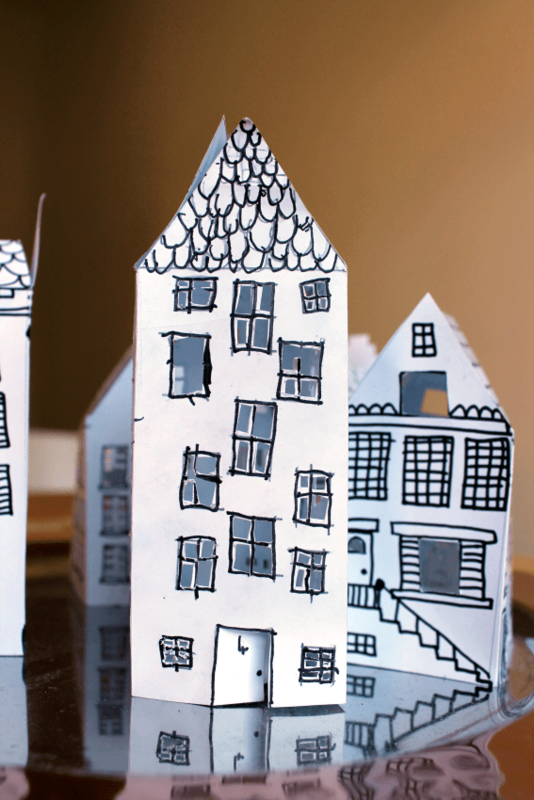 If you’d like to explore the topic of houses you might like to make a junk model house, a paper roll town, shell houses, fairy houses, or shape houses. Add in a world-wide element using these map activities (includes free world landmarks printables). And for more gorgeous lantern ideas try a different style of lanterns: jam jar lanterns, big paper lanterns, salt dough lanterns, winter sky lanterns. Hello – where is the link to the house template?